At 51, Jon Ross ’83 has found a way to channel his boundless energy for the greater good. After successful careers on Wall Street and in Hollywood, he founded MicroAid International, a nonprofit for which he travels the globe building homes, replacing tools of livelihood and restoring self-sufficiency for disaster victims in far-flung locales. The mission is simple: to keep the focus on the victims long after the worlds attention has moved on. No other organization takes this long-term, hands-on approach to helping people, Ross says. Once the initial rush of aid and press coverage has faded, MicroAid (microaidinternational.org) looks for small projects with the potential for big impact in hard-hit towns and villages. The nonprofit has constructed homes in Sri Lanka and built canoes and replaced fishing kits for villages in Samoa. MicroAid steps in two to three years later as the NGOs depart for the next international crisis but without fully resolving the situation left behind, says D. Leslie Winter, a longtime friend of Ross’ and a member of MicroAid’s board of directors. Upon graduation, Ross accepted a position at the Wall Street brokerage firm Paine Webber, then headed west after a few years and landed a job as a creative executive at 20th Century Fox. Dissatisfied with endless dealmaking that resulted in few completed projects, he left in 1989 for New World Pictures, the small, prolific studio established by maverick director Roger Corman. With no hands-on filmmaking experience, the one-time major studio exec began his new career with that age-old initiation assignment: a coffee run. He spent the next year learning every job in the studio, including electrical work, camera work, set building and design. It proved to be a life-altering experience. From there, Ross forged a 15-year career as a freelance producer of television commercials. Though he was no television fan, nor had he any love for advertising, the money and the freedom to set his own hours enabled him to pursue interests such as world travel and volunteerism. The latter included his work with the Southern California chapter of the Achilles Track Club (now Achilles International), an organization for people with disabilities that hed established in 1987. Ross ran the club for 20 years, guiding blind runners in races and marathons, training other guides and handling fundraising, administration, press and outreach. He also volunteered for three years with Habitat for Humanity, earning certification as a construction crew leader while building houses for low-income families in the Los Angeles area. In 2009, Ross gave up his television career and combined his various skills and interests by founding MicroAid. The idea stemmed from his travel experiences as well as from a 2008 project for which he was commissioned by a Wall Street firm to help distribute relief funds in Sri Lanka, which was still suffering in the wake of the 2004 tsunami. 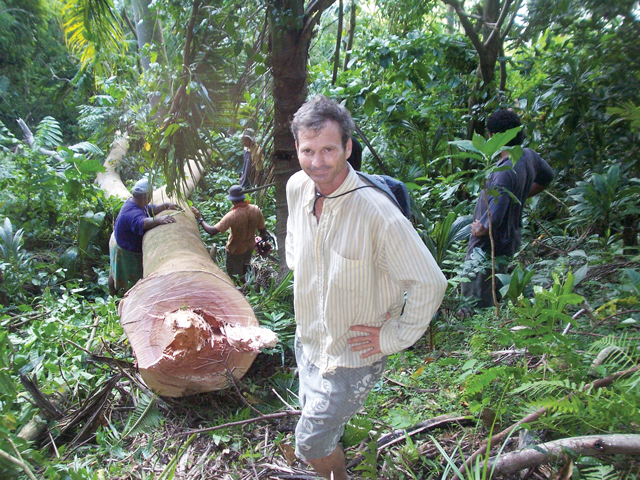 When the projects funders backed out, Ross made sure his time and research would not go to waste, going solo and raising money to build houses on the island. Thus MicroAid was born. Though Ross has since added a board of directors, MicroAid remains largely a one-man operation. After conferring with village elders and religious leaders, as well as local nonprofits and the departing NGOs, Ross along with his board starts raising funds. Then, acting as project manager, he makes a first visit to the area to coordinate with local organizations and international NGOs. Once funding is in place, Ross returns to the site, buying local materials and hiring locally to complete the project at minimal expense. 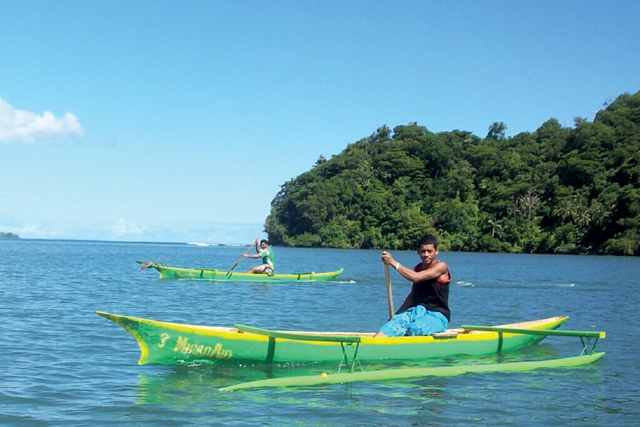 Two villagers paddle new MicroAid canoes across Lefaga Bay. Photo: John Ross ’83Most recently Ross helped the roughly 260 people of Matafaa, a remote village on Lefaga Bay on the southern coast of Samoa, to replace canoes destroyed in the 2009 tsunami. The loss had been crippling, as canoes are necessary for families to cross the bay to attend school, to shop and to catch the bus for the 90-minute commute to jobs in the capital of Apia. In ordinary times, villagers would need to build only a single canoe every few years and, because of the rarity of the occasion, the skills were not necessarily passed down to the next generation. But after Ross arrived and secured the materials, he and the villagers set up a makeshift factory, building 16 canoes in six weeks. The elders also used the opportunity to teach the craft to the younger generation, several of whom used their newfound knowledge to get jobs building canoes in other villages. MicroAid, which is based in Ross adopted hometown of Venice Beach, Calif., currently raises $30,000$50,000 per project. The next venture, scheduled for this spring, is in Peru, with projects planned for Burma, Haiti and Nicaragua. “The five-year plan is to train three other project managers so that we can have multiple programs operating at the same time, and to raise at least $250,000 annually. And, I hope, to inspire people to help those in need,” Ross says. Every dollar donated to Micro-Aid goes to programs; the overhead is funded by the board and by Ross, who doesn’t take a salary. He funds his own part with savings from his careers and from the proceeds of a small business he founded in 2003: Soothe Your Soles (sootheyoursoles.net), cleansing towels for feet that Ross created and markets to yoga studios, spas and resort hotels. “It pays for my nonprofit habit,” he says. MicroAid’s name derives not only from the size of the projects it focuses on but also from the fact that it takes relatively little money to complete them. For example, Ross says, it only costs about $7,000 to build a house in Sri Lanka. Justin DeFreitas is a Bay Area writer and graphic artist.